Focusing mainly on platforms including Facebook Live and YouTube, the team has already live streamed to more than two million people around the globe - a number that is increasing all the time. “All of the sports we work with are really excited about live streaming,” says Adam Amor, founder of Buffoon. “Especially the ones that don’t traditionally get much terrestrial broadcast coverage. Whilst the popularity of live video content is growing dramatically, it does come with some challenges. Adam explains, “Having a decent upload speed is always one of the biggest challenges we face. Viewers have come to expect a certain level of quality, especially from the sports they see regularly on television. They want to watch in the highest resolution possible, without any lag or dropped frames. Paired with B4 optics, the Buffoon team use a mix of Blackmagic Studio Camera 4Ks and Micro Studio Camera 4Ks for acquisition, relying on MTF B4 2/3” to Super16 PL adaptors to mount the lenses. 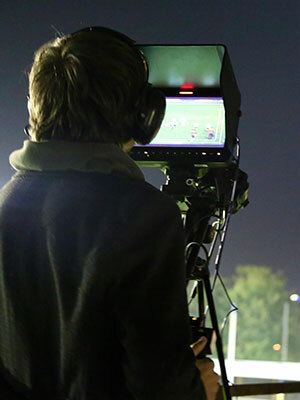 Delivering engaging live content for so many sports is a feat in itself; each stream has to be different depending on budget and preferences. Managing this ever-changing program, the Buffoon team utilise the ATEM’s two downstream keyers and built-in Photoshop plugin for presenter led segments, commentary, instant replays, sports graphics overlays (such as scoreboards, timer substitutions, yellow/red cards) and social media feeds. “Thanks to this, our overall production quality has significantly improved,” Adam attests. For Ospreys’ rugby matches, and other stadium based sports, the Buffoon team streams from the gantry. “However we are always looking to expand, evolve and be able to offer new features to clients,” says Adam. “And we have recently bought a new wireless transmitter/receiver so that we can have additional cameras at pitch level for future streams.